Researchers have made great strides in treating patients with chronic myelogenous leukemia (CML). Because of the effectiveness of targeted treatments like imatinib mesylate (Gleevec®) and dasatinib (Sprycel®), for some patients CML is similar to having a chronic illness. Their condition is managed well, and they live with it for a long time. While this offers increased hope for people diagnosed with CML, a long-term illness presents its own set of emotional challenges. Stay in touch with the people who comfort you. Family and friends, whether they live next door or far away, are important members of your team. The practical help they provide on low-energy days, and the comfort they bring you with their love and concern, can be considered a form of “treatment.” Sometimes it’s hard to ask for or accept help. You may worry that you’ll be a bother or burden, but family and friends usually want to help and be involved. If that’s the case, let them – it’s reassuring for them and good for your health. Visits, phone calls, letters and emails are all good ways to keep in touch and get support from those who care about you. Acknowledge your emotions. A chronic illness might make it necessary for you to adjust the plans you had for yourself, and this can affect you emotionally. For example, people sometimes struggle with feelings of sadness or worry as they think about facing the future with a long-term illness. A support group connects you with others in similar situations who can share how they are coping. Individual counseling is also available to help you figure out how to live as full and active life as possible with a chronic medical condition. 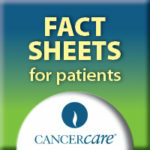 CancerCare‘s professional oncology social workers lead support groups and provide individual counseling free of charge. Draw strength from your spiritual side. Strength comes from many different sources. One place people often turn to when coping with illness is spirituality, which can refer to one’s religious beliefs, faith and/or life philosophy. Spirituality is about finding purpose and comfort in your own personal understanding of the meaning of life. Examples of activities that let you explore your spiritual side include prayer, meditation and reading life-affirming texts. Invest in your own resilience. Resilience is the ability to manage whatever might come your way. Having a good support system is part of being resilient, but so is being good to yourself. Try to do small things to take care of yourself every day. Read a good book, buy yourself a small gift, watch a funny movie or listen to your favorite music. These may sound like luxuries, but pampering yourself in little ways goes a long way in helping you adjust to life with CML. Treating yourself right and finding new ways to enjoy life will help you accommodate any changes CML may bring.